The last time I had crepe was at the Southern Cross Station food court - rich caramel, apple, and lots of out-of-a-bottle whipped cream (I like Asian crepes, but this was sickening). But throughout the past ten years or so, I've mainly had crepes from Ken's Crepes - a very popular store at the Mindil Markets in Darwin, owned by our previous neighbours. 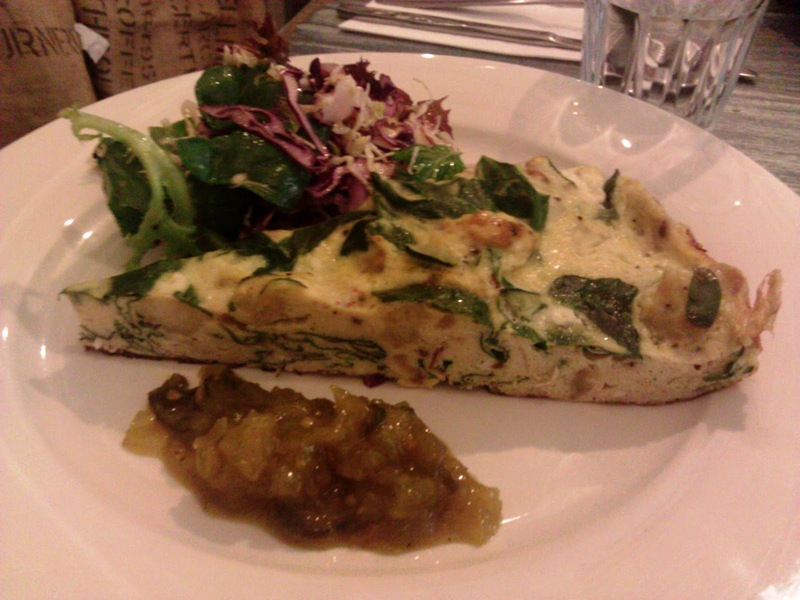 Roule Galette has two branches, the original is located near Swanston and Flinders Lane intersection. Less known is the second branch across the Melbourne Aquarium, where there is a row of bright orange stores underneath the overhead train tracks. Originally, we intended to visit Roule Galette last week, armed with the Groupon voucher bought from almost half a year ago. 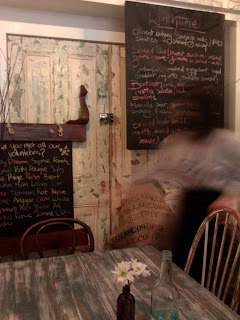 However, the venue was closed for Cup day, and we dined at a nearby cafe instead. Website: official website with good pictures of the crepes and crepe making, a detailed review from The Age, a blog with pictures of Flinders branch and more yummy crepe pictures on another blogger's write up. Price: mostly $5 to $15, full menu online (menu is the same for both sites), and pictures below for those of us who love visuals. Iced coffee - maybe I should have mixed it more, but initially the coffee taste was quite strong, then as the ice cream melted through, it became too sweet. Plus I felt there was too much cream for the amount of iced coffee served. 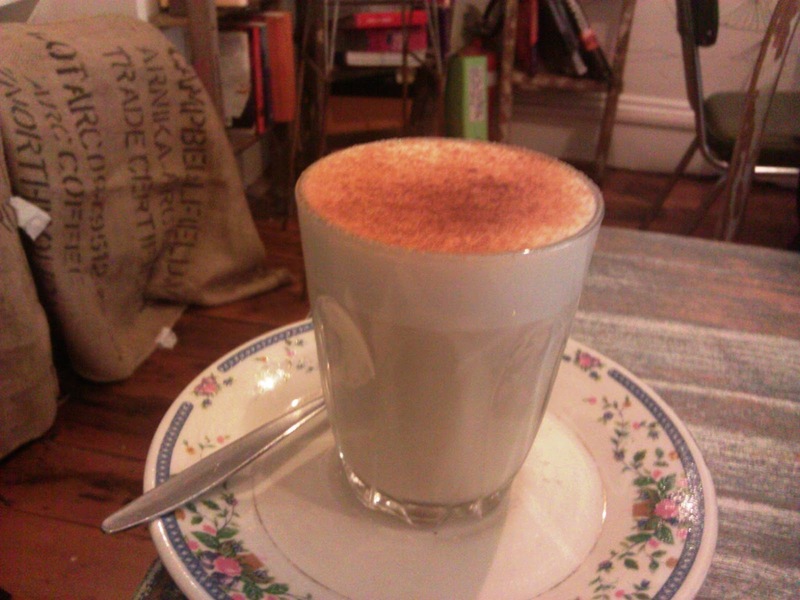 Chai latte - another case of milky chai with minimal spices. Disappointing. Also the top was sprinkled with a strange peppery/chilli powder, I wonder what it was. Escargot - "filled with 8 snails in a white sauce with garlic and parsley". This was one of the galette options. According to their website, galette is savoury and made from buckwheat flour (gluten free), whilst crepe generally has sweet fillings, and is made from wheat flour. I haven't had savoury crepes/galettes for years, and really enjoyed the buckwheat flavour, and texture, which was stiffer and rougher than sweet crepes. The sauce was thick, almost lumpy, and had no particular flavour, other than a garlic tinge. And how about the snails? Who isn't fascinated with snails? Let's take a closer look. Escargot is the French word for snail, and in common use it refers to the edible snails in French cuisine. The snails were okay, my friend commented that it was like eating mussel. I found it rather tasteless, compared to Chinese-style snails. Apparently the small river snails are a Shanghai specialty. Now that I think of it, I've eaten snails many times, scooping the tasty meat with a toothpick, and not once realising that it was considered an "exotic" food. Gourmande - a sweet option with "ice cream, fresh banana, chocolate, strawberry, flaked almonds." This was the most elaborate, and most expensive items on the menu. I enjoyed the crepe itself, the rich chocolate sauce, the lovely fresh fruits, and the almond crunch (unfortunately, the almonds were slightly burnt). The mix of flavours were nice, but slightly chaotic - my friend commented that the dish was "not particularly French, a simpler crepe with ice-cream on side might have been better." Other: both branches of Roule Galette offer indoor and outdoor seating on bright orange tables. However, the Flinders branch is cosier (ie limited seats) whilst the Rebecca Walk branch is spacious and modern. Today, we dined at Rebecca Walk and there were plenty of seating even during lunch hours. The French music played in the background, indoor decorations were simple but comfortable, waitress was nice, and there was a constant lovely aroma of cooking crepes. Ah, a pleasant and relaxing environment for a long chat. On a side note, I can't help notice the child-like Comic Sans font - it's one of the only stores I've seen who uses it. Rating: 4.5/5 I liked the texture of the crepes themselves, and there was an exciting variety of fillings. There were "crepes flambees", which would be interesting to order next time. The crepes were reasonably filling, but I'm not sure the sweet crepe we had was really worth $15. Drinks could be better. Finishing up on a good note, although we've made yummy crepes ourselves for breakfast in Ballarat, a trip to the crepe cafe was fun and I would happily visit again (yes, even without the vouchers)! In recent months I've had numerous promptings to try banh mi (did you know this word has been added to the Oxford English Dictionary). It's like a bread roll, but it's soooo good, my Vietnamese friend said. Okay, how good can a roll get, I thought. But I kept the advice in mind and stopped in Footscray yesterday to try it for the first time. BBQ chicken banh mi - not sure if the bakery usually makes it fresh (we went quite late in the evening) but our rolls were premade. Regardless, bread was good, lovely golden crust with fluffy insides, and unlike some baguettes I've had, this did not require too much work to chew. Let's have a look on the inside (see below)! The meat was chicken chunks, with flavours quite similar to a lemon grass chicken chop at any Vietnamese restaurant. Sweetish, picked carrots and daikon, coriander, and chunks of chilli. Loved it, generous servings of the filling, and all the flavours worked together really well. But I will probably be more careful with the red chilli next time - had a bite of one accidently and I was in agony. Other: for awhile I couldn't figure out the name of the bakery, because it has no signage outside. Why should it, my friend said, everyone knows where it is. Other foods on offer include desserts, snacks, and some strange looking hot foods. One looked like a giant mushroom but was apparently a sweet flour based dessert. I may have offended the lady by asking about it and saying, hmm maybe next time. Rating: 4/5 great value and taste at a cheap price. Definitely better than Subway. I'm surprised this isn't being sold in Melbourne CBD - similar to sushi and Vietnamese rice paper rolls, banh mi makes great on-the-go food. Will try other stores and compare. Trams are confusing nowadays with route a's and d's. According to the website, part of it is an attempt to allow mysterious/phantom routes to provide a service, whilst repositioning them on the network. Anyway, after a meal at Kinfolk, we caught tram 55a, which stopped at the markets. So, we snacked whilst waiting. 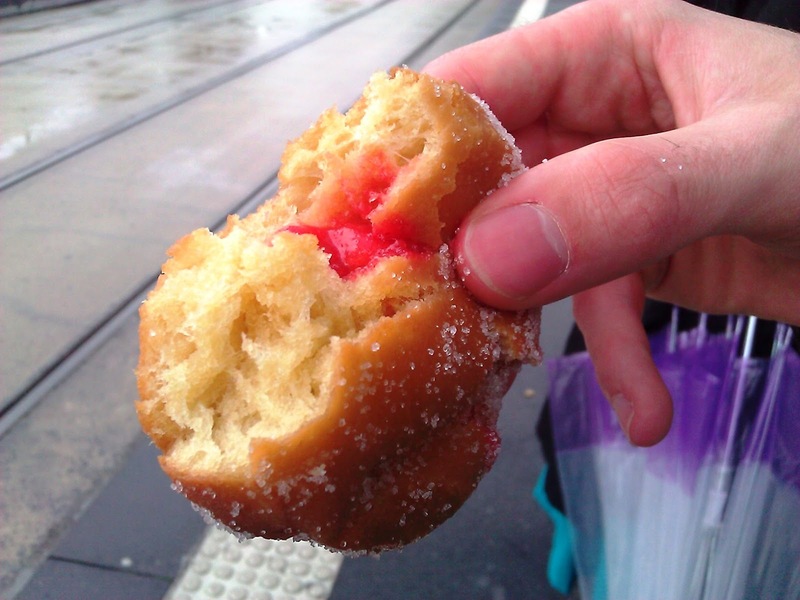 Because I ate a doughnut in the same week at Footscray, I will write both reviews here. Also click for further discussions on the "best" doughnuts in Melbourne. American Doughnut Kitchen: page on the QV Market website and more interesting history (apparently this is a family store that has operated in the same van since the 1950s). 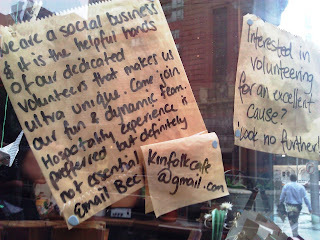 Amazingly the Doughnut Kitchen has its own urbanspoon page, and pretty blog reviews. 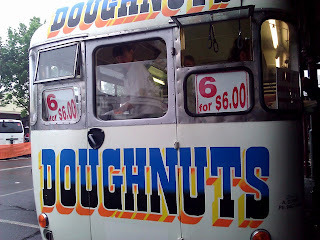 Olympic Doughnuts: an age article with a direct comparison of the two doughnuts. Its own urbanspoon page and a photogenic blog review. American Doughnut Kitchen: $6 for 6, although apparently the people serving you can sometimes be charmed into giving you more. Sadly, it didn't happen this time. 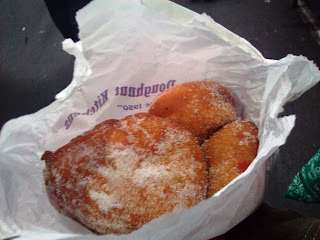 Olympic Doughnuts: from memory, similar price of about $1 each (will stop to check exact prices next time I'm there). American Doughnuts (image above) - I remember buying the 6 donuts in the past and only being able to finish one. Personally, I find jam donuts too oily, and the jam too sweet. But I invited the solipsist, a long-time fan of this store - "sweet outside, doughy inside and the delicious smell, the feeling of biting into them and getting warm sweet jam alongside the dough... wonderful." However, on this occasion he was disappointed with the batch of donuts that were hard outside and with a tough, rather than fluffy, dough. Olympic Doughnuts - didn't have a photo to compare, but the doughnut I was served the other day was brown, even more oily than usual, and the dough tasted terrible. According to the Age (which conveniently has a good photo of the Olympic Doughnut) - the difference is cosmetic, but I would say the American Doughnut was much more palatable. I had a bite at Footscray that day, threw the rest in the bin and felt unwell for awhile. This is surprising as many people seem to have had good experiences with the doughnuts there. Maybe the moral of the story is that quality of doughnuts vary from batch to batch. 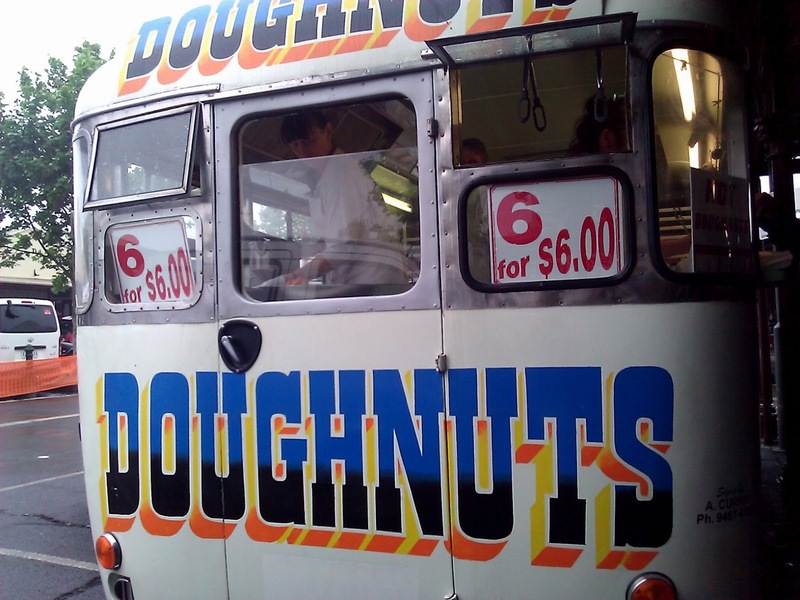 Other: not to be confused with the van serving jam doughnuts, at Victoria Markets there is a van called the "Spanish Donut Van", which serves churros. Rating: 3/5 for the one at American Doughnut Kitchen and 1/5 for the one I had at Olympic Doughnuts (maybe churros are more my type of oily, sweet snacks). We attended the Global Perspectives Summit at Melbourne University, and were introduced to social enterprises - which are "organisations that applies business strategies to achieving philanthropic goals." Kinfolk relies on a few core staff, providing training and experience for a bunch of volunteers, and distributes its profits between four projects, in Rwanda, Ghana, Palm Island and Melbourne itself. 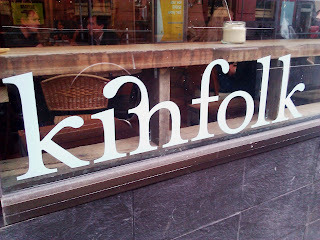 Website: Kinfolk's cute and informative official website, a blog review with photos, an interview with the manager and many more reviews on urbanspoon. Price: generally ~$10 for lunch mains (although the lamb was $13), sample breakfast and lunch menus are available online. 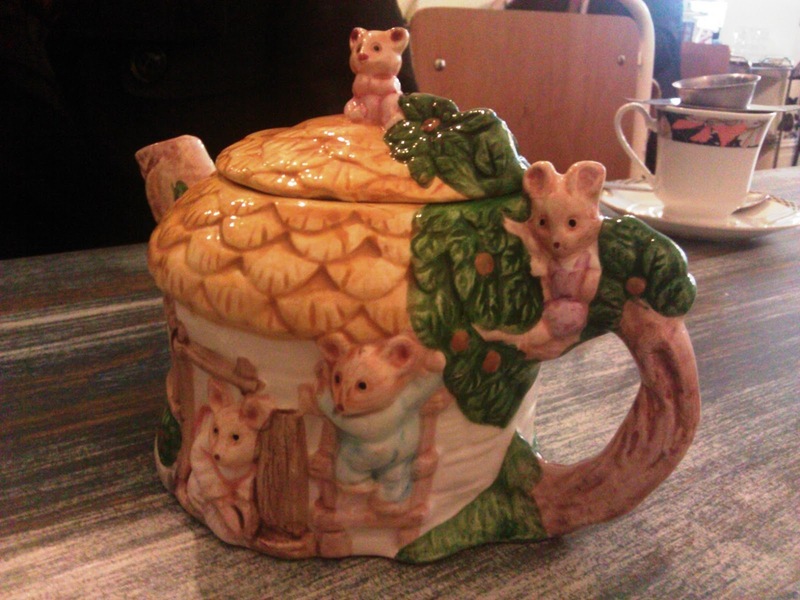 Lemongrass and ginger tea - served in a cute teapot, aww. Chai latte - very milky, not too sweet (which is good, because the last chai latte I had from a different cafe was too milky and sickly sweet). However, there wasn't much of the "chai" flavours. 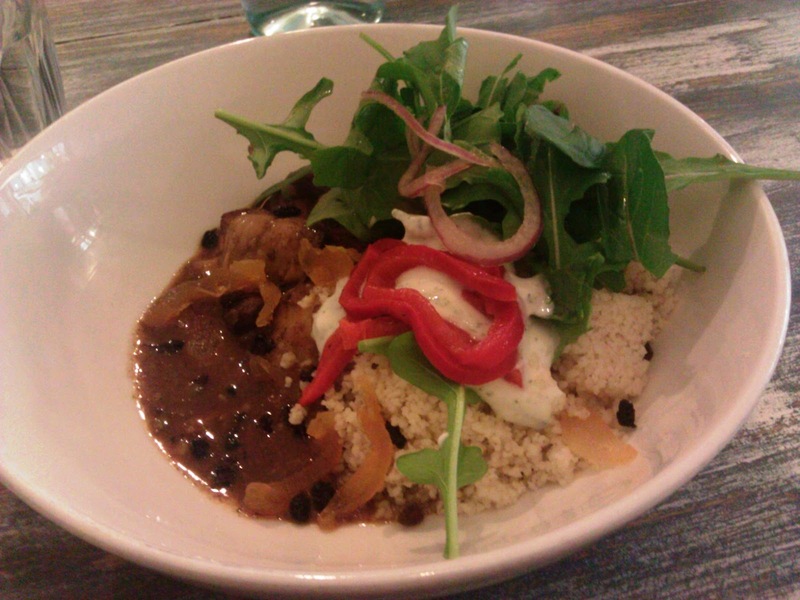 Braised lamb shoulder - "cous cous, roquette, currents and minted yoghurt." The lamb was warm, flavoursome, and soft. Never had currents or dried fruit with my braised lamb before, but the flavours worked fairly well, with the plain cous cous and the slightly bitter rocket. Small portion. There were also a few large chunks of lamb fat, and a mysterious squishy meat part that reminded me of fish ovaries (I still don't know what it is). On a side note - yes I had to look up if rocket and roquette were the same vegetable. Sure enough, they are. It feels pretentious when cafes use fancy words to replace common ones, but I suppose it works in helping people imagine a fancy delicious meal which in reality is quite simple. Frittata - "Sliced cauliflower, zucchini, aged goats cheese frittata with salad and relish". I've invited our guest, the solipsist to give a verdict "not great but not terrible… somewhat flavourless, but with a nice texture. I can forgive the lack of flavour because the relish was nice. Overall, I've had better, though. The salad was also a bit salty." Also a small serving. Other: a variety of tables and chairs for seating. Some were quite communal benches, which is different if you're not used to it. The crooks and crannies were filled up with artsy bookshelves, handwritten book covers with poetry and the likes. A lovely atmosphere to sit and chill. After your meal you will be given a coffee bean to choose which project you would like the profit to be distributed to. 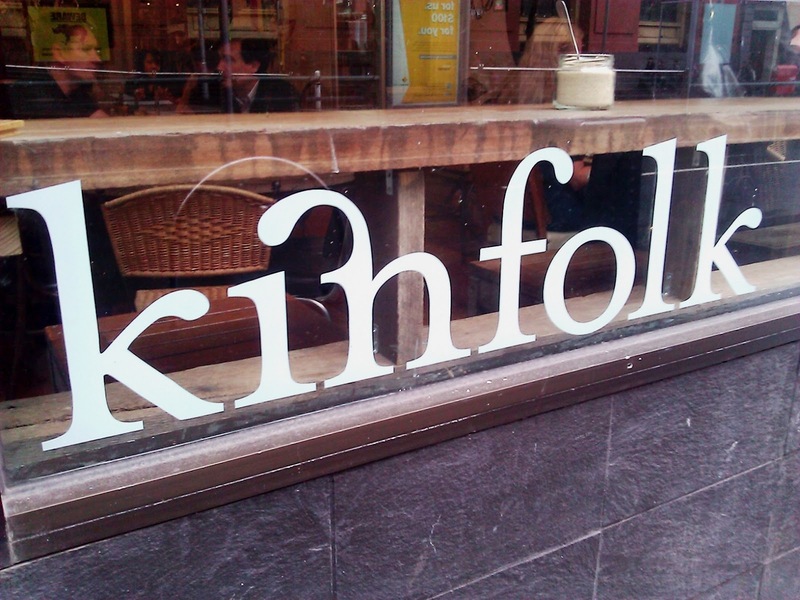 Rating: 3.5/5 Kinfolk has generally positive reviews with 92% likes on urbanspoon (currently)! Like others, I do really like the concept of the socially conscious business, equipping volunteers with employable skills, and donating to community projects. However, the quality of the food was just average. From other reviews, the coffee seems to vary from good to very bad. For $13, I would expect a slightly larger bowl of lamb. We did have to go for a second meal elsewhere, which always drops my rating for a place. In summary - do visit, for the lovely atmosphere and the unique business concept, but make sure you're not too hungry on the day. I remember the first time I discovered Don Don (next to Melbourne Central). A store with signage that was barely noticeable, yet the store was popular and bustling. The inside heating was reassuringly warm as I queued for a dine in meal, and the food appeared faster than fast food. Plus it was cheap. Oh, how I love cheap meals. 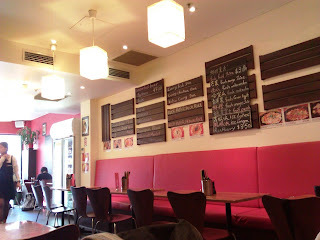 I just noticed, there has been quite a number of Japanese-styled cafes already! Don Tojo serves exactly the same menu as Don Don (hence I will just write one post for both), but is a more recently opened branch in Carlton - a few minutes from Melbourne University. The seating area is definitely a lot more comfortable and spacious, plus Don Tojo is also serves alcohol and offers good prices for beer - so says the reviews, I wouldn't know. - The urbanspoon reviews for Don Tojo (not many), and a Weekendnote review. - Or, for way more blog reviews, pictures etc, Don Don at urbanspoon. Rice - which comes with all meals, after all the places are called don something. 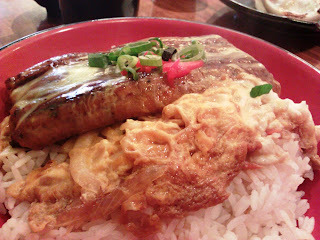 And donburi, or don refers to rice bowl dishes, where a dish is served over rice. Beef sukiyaki (dondon box dish 1) - "beef slices in a sake soy sauce", caramelised onions, and sprinkled with bright coloured pickles. It's nice, tasty, sweetish. It's hard to get sukiyaki wrong. 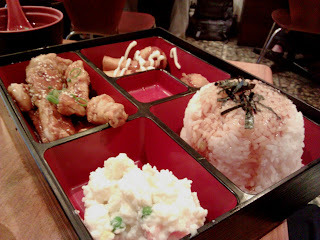 Teriyaki chicken (dondon box dish 2) - "pan grilled soy chicken". This photo isn't great, but the sauce really was blackish from the burnt parts of the grilled chicken. Slightly charred is okay, but a strong burnt taste makes me think carcinogens. Sauce was also too salty. Salad (dondon box dish 3) - the dondon box we ordered came with rice, the teriyaki chicken, sukiyaki beef, and this salad. Great value! Usually these would come in one bento box, but I ordered takeaway today. Salad, or really, the fruits, were pleasant. A piece of tofu, cucumber, apple and orange. Sashi don - "salmon/ocean trout sashimi on rice", with pickles, marinated dried shitake, salad and tofu. Tasty and refreshing. A short lesson on fish. I've always been confused on the difference between salmon vs ocean trout. My sources say that both are part of the salmonidae family, and either can be served raw or cooked. The texture and taste is supposed to be different. I might take a guess and call today's raw fish trout, because it was mild rather than the creamy salmon taste. And the sources say that the difference between the rainbow trout I often buy whole in the local supermarkets, and ocean trout, is that ocean trouts are reared in saltwater. Other: Don Tojo/Don Don would have to be one of the well presented takeaway meals I've had in recent times. For both dishes, rice was packed separately with sprinkles of seaweed. The sashimi and salad was reassuringly cold, whilst the rice and meats were hot (food poisoning prevention). The two meats were also packaged separately in small containers, and that meant the tastes weren't mixed up or soaking through the rice. Unfortunately not great for the environment with all the plastic containers though! Also, this meal is a lighter, healthier option compared to some of the greasy (but tasty) Asian cafes nearby. Rating: 4/5 I'm a big fan of both branches. A no frills, limited menu. But a perfect student meal with filling, well presented, healthy and value for money meal. Only problem I have is that there's several items on the limited menu that I've tried and wouldn't order again - the burnt teriyaki chicken, some of the curry dons (eg. the chicken curry seems to be the same meat as the teriyaki chicken in a big bowl of Japanese curry sauce). I used to live on Grattan St and tried nearly every cheap place along the way. I've had takeaway sushi from Rakuzen several times, but decided to dine in this time. Website: no official sites or reviews that I could find, just an urbanspoon link. 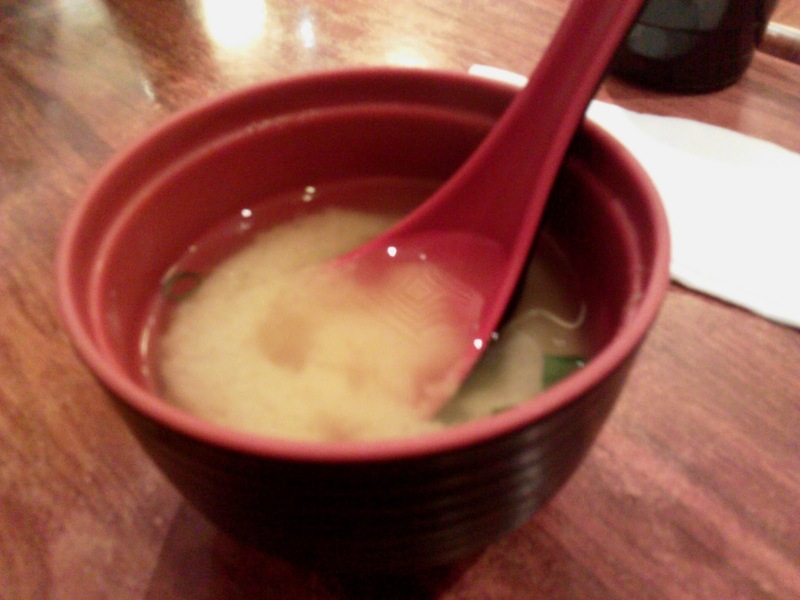 Miso soup - from memory it was complimentary to the meal. Way too salty, with not enough tofu or wakame (seaweed). Not very nice. 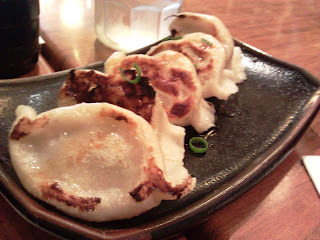 Dumplings - tasty pork filling, tasty and pan fried the right way. Yummy. Unagi with rice - generous serving of unagi, with an egg omelette with onions on side. I thought all unagi came in a pre-prepared state and taste roughly the same. But the taste does seem to vary from restaurant to restaurant, and this wasn't the best one I've had. Seemed to be extra greasy too (maybe from the egg? ), and I ended up not finishing the dish. Chicken bento - chicken, with spring rolls (not very nice), and a potato salad on side. Chicken tasted dry. 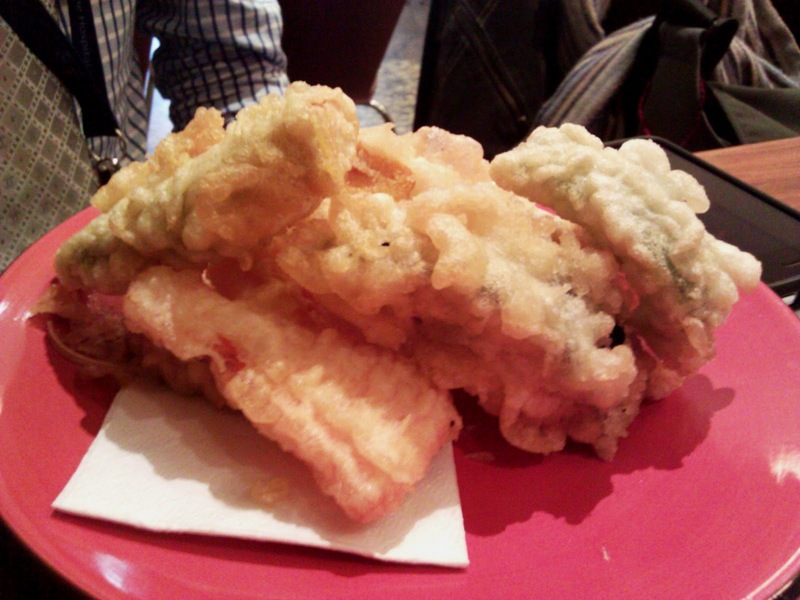 Tempura with udon - the tempura (above) came with the udon (below). 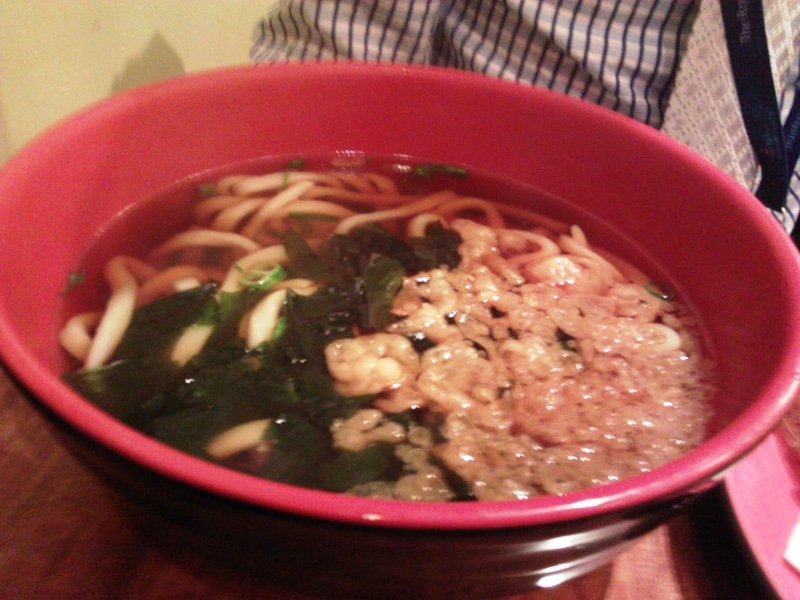 Udon was normal, with a decent shoyu soup. Tempura was hot and crunchy, but the batter was too dense. Other: indoor environment was pleasant and comfortable. Outdoor seating on hard metal chairs and tables for those who prefer to sunbathe. We noted that the menu was written in English and Chinese (not Japanese). Rating: 3/5 a so-so meal. Come for a good fill, not for the food itself. I've mentioned before that I don't mind imposter Japanese restaurants, as long as the food is good. But as my friend pointed out, this was using Chinese cooking methods to make Japanese food, which didn't work out well. Plus it was salty.